Kisses from us, too, Benny! Ooooh! Can I get in on that action?!!? PLEASE?!?! So so sweet. Thinking of you guys. Aweeeeeeeee. Wet licks to Mom, Benny, and Lily. Those look like the super de duper special healing powers kinda kisses! Be well, kind sir, your momma needs those smooches more than ever now! Oh......Andrea gets Benny kisses. Nothing better in the world than doggie kisses. Keep on truckin' Benson. You're a good boy. Awe!! A very sweet picture! Definitely no words needed to feel the love in this picture!!! Quiet kisses are the best ! No words need be said. Have a wonderful wordless Wednesday. Awww. Momma kisses are the BEST! Aww, he is looking better than when you brought him home. It must be all that love. Aww, such a sweet, loving photo of you two! I love it. It would look beautiful in a frame. 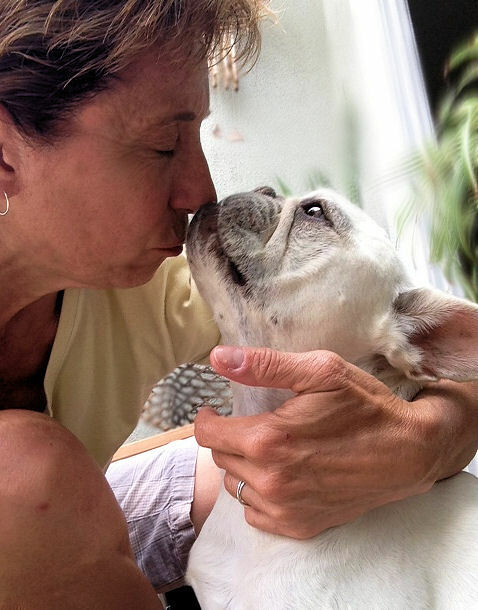 We LOVE THIS... ♥♥♥♥♥ PERFECT fur Wordless Wed..
Hi Benny, pal I see your mom is kissing you, my mom does that all the time wuaf wuaf, but I rather be kiss by your Lily. Tomorrow is an important day for your treatment. I will be praying for you with my mom to have a guaf day!!!!! Benny my friend do not forget FIGHT LIKE A FRENCHIE!!!!! Such a poignant photo. Brought a tear to my eye. Me and my 2 chi's are giving you lots of kisses too, Benny! So beautiful. We can see the love. Mucho slobbery licks and kisses from us too, Benny Wenny! SOoooooooo......thinking about cha!!! Hope you're having a feel good evening. Smooches to you both. So sorry to hear about this darn bleep in the wellness radar of your family! Know we are thinking of you all and GOOD thoughts for a bright and healthy future. We bet your Mom gives you lots an dlots of those kisses, Benny - and we can see the love just beaming from your eyes. Love is so good for you Benny! Well that is just the sweetest thing. Gotta say there is a little tear in my eye, it's a happy tear to see such love. OHHHH kissy! sweetest kissys ever! Precious.....REALLY precious. Benny and Mom doing kissie-face! Love is grand isn't it? awwwwwwwwwwww - she loves you, Benny, and so do we! Nothin's better than mommy kisses for her sweet boy! Love the photo. We just learned about your fight, Benny. Just know that there are many out there sending love, prayers, juju and well wishes in your fight! And thanks for visiting us after our long blogging break. We hope hu-mom will keep it up this time. With a picture like this no words are necessary. Mommy kisses are the best. We's rootin' for ya, Benny! We think you're just so cute and sturdy and cuddly! Sending healing vibes, and snuggles and wuzzes. This makes us smile REALLY big. Benny ... you are so loved!